As a small, resource-scarce nation, Singapore’s energy consumption is disproportionately high. To meet our growing energy needs, artificial intelligence (AI) is being used to optimise the harvesting of solar power. Additionally, AI is enabling the predictive maintenance of Singapore’s numerous elevators, ensuring that they run smoothly, and in an energy-efficient manner. Despite its reputation as cutting-edge technology, artificial intelligence (AI) has actually been around for nearly half a century. As early as the 1950s, the English mathematician and computer scientist Alan Turing had already raised the idea of machines that could think, and by the 1970s, nascent forms of machine learning had appeared, albeit mainly dealing with simple automation. Notably, the processing power of computers back then imposed a strict upper limit on the capabilities of AI. Fast forward a few decades, however, and today’s blazing fast graphics processing units allow computations to be completed within seconds where they would have taken days in the past, said Dr Thomas Ho, department head, Smart Energy and Environment, at the Institute of Infocomm Research (I2R). 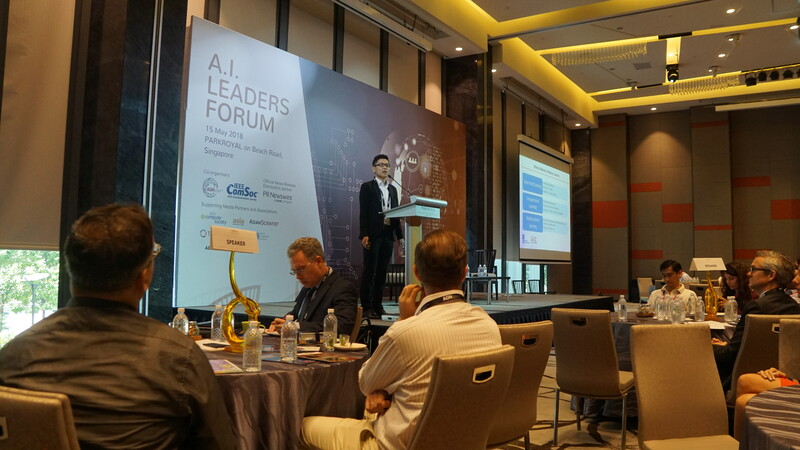 He was speaking at the AI leader’s forum on 15 May 2018, where he explained how AI is now being applied to solve one of Singapore’s most pressing issues—sustainability. Small as it may be, Singapore is one of the top consumers of electricity in the world, said Dr Ho. Furthermore, unlike other energy guzzlers such as the United Kingdom, whose power consumption has remained relatively steady over time, Singapore’s usage has continued to increase. Dr Ho called this an “alarming problem”, given that Singapore is resource-scarce and therefore must rely heavily on other countries rich in fossil fuels. “As Singapore becomes more and more technologically advanced, and as the number of gadgets attached to human beings increases, we can only expect our energy consumption to increase further,” he warned. To address this growing demand for energy, Singapore is exploring renewable energy sources, which will not only reduce the city-state’s reliance on fossil fuels, but also shrink its carbon footprint. “For Singapore, being in the tropics, the obvious and immediate answer is to use solar power,” said Dr Ho, highlighting, as an example, a public housing block in Ang Mo Kio which uses solar energy to power its lifts, lights and water pumps. But simply installing solar panels on the rooftops of apartment blocks does not solve the problem of intermittency—the amount of electric power generated from sunlight varies with weather conditions and the time of day. Batteries are thus required to store excess power during peak energy-harvesting hours for use at a later time. However, since batteries cannot be charged and discharged at the same time, being able to schedule charge and discharge cycles in sync with weather forecasts and usage patterns is essential. “You have to schedule energy storage and factor in the amount of sunlight that you are likely to harness, and whether the amount [of energy collected] is sufficient for use by the apartment block,” said Dr Ho, adding that the system must know when to draw more electricity from the energy grid should solar power fall short. “Hence, we use AI in this management system. We let the machine run an optimisation algorithm to find the best solution to adopt at any time of the day,” he explained. Dr Ho further noted that the data being fed to the AI had to be of high quality, since having substandard data informing the AI algorithm could result in unwanted outcomes, such as power outages. Therefore, the system was also designed to automatically evaluate data quality—almost like a human making decisions about which news sources to trust. In addition to tackling the challenge of energy demand, Dr Ho also shared how AI is facilitating the maintenance of elevators—a ubiquitous feature in Singapore, given its large number of high-rise buildings. He highlighted the persistent issue of lift breakdowns, causing people to be trapped in lifts. 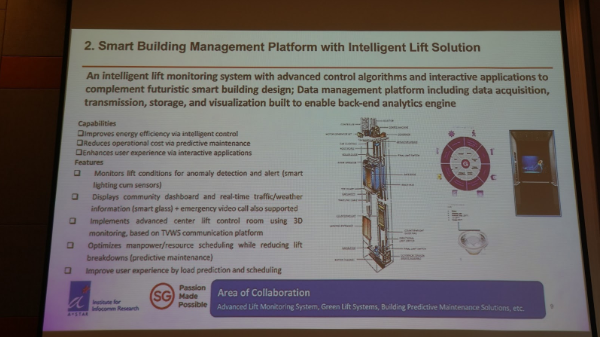 Using sensors and a microcontroller, Dr Ho explained that the remaining lifespan of each mechanical part in elevators can be estimated automatically, and the in-built AI even recommends servicing timelines. This means that engineers know precisely when to perform pre-emptive maintenance and which elevator parts need replacing. Over the long run, ensuring that elevators operate in prime condition contributes towards their energy efficiency, since less electricity is consumed to overcome the effects of wear and tear, Dr Ho noted. “These are the small things we do with the hope of making Singapore a more sustainable nation,” Mr Ho concluded.